425. One of the many forms of rotary engine. A is the cylinder having the shaft, B, pass centrally through it. The piston, C, is simply an eccentric fast on the shaft and working in contact with the cylinder at one point. 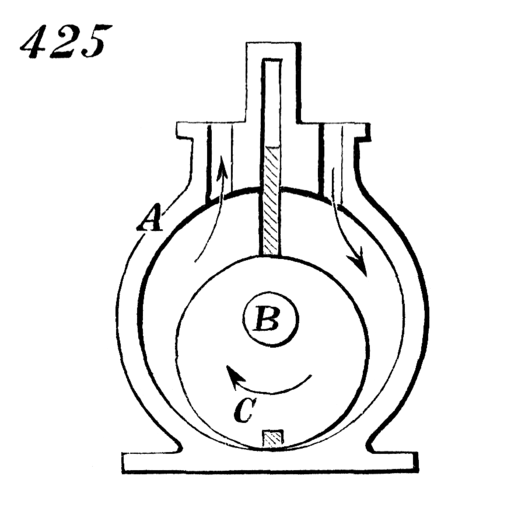 The induction and eduction of steam take place as indicated by arrows, and the pressure of the steam on one side of the piston produces its rotation and that of the shaft. The sliding abutment, D, between the induction and eduction ports moves out of the way of the piston to let it pass.